This is a fluffy egg casserole that is reminiscent of the 1960’s and 1970s. It’s the “feel good” dish that brings to mind a simpler, less complicated time, a time where conversations happened at the dinner table. Bring that lovin’ feeling back home. Listen to the Righteous Brothers while you’re enjoying it! Saute onions in 4 tablespoons butter. Stir in flour, and then gradually add ½ cup low fat half and half, stirring constantly until thickened. Add cheese spread and blend well. Drain broccoli thoroughly. Combine sauce and broccoli. Add eggs, mixing well. Pour into greased 1.5 quart casserole. Bake at 350 for 45 minutes to an hour, making sure the center is cooked by testing with a thin knife through the center. Life Just Got Easier… Love Livin’ the Low Carb Life Style! 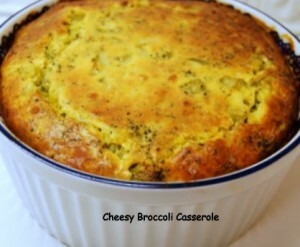 I’ve tried the cheesy broccoli casserole and my family and I LOVE it!! I’ve made several of your recipies now and love them all – the guilded muffins are terrific! I am thrilled that your family is enjoying the recipes! Thank you so much for sharing your experiences. Your feedback is very helpful and much appreciated. Thank you Maggie.